Osteoporosis, muscles spasms and nails broken with little water all are symptoms of lack of calcium. Calcium is necessary for maintenance of teeth, muscle contraction and blood clotting. Weak Teeth: Calcium deficiency appears on the teeth. Tooth decay is the first symptom. If the lack of calcium in childhood then child’s get teeth on later age. Weak Bones: The shortage of calcium falls on bones. The bones of the children beginning to weak. The lack of calcium can lead to bone fracture easily. Muscle cramps and pain may persist forever. In extreme cases, it can lead to rickets. Weak Nails: Calcium is required for strong nails. 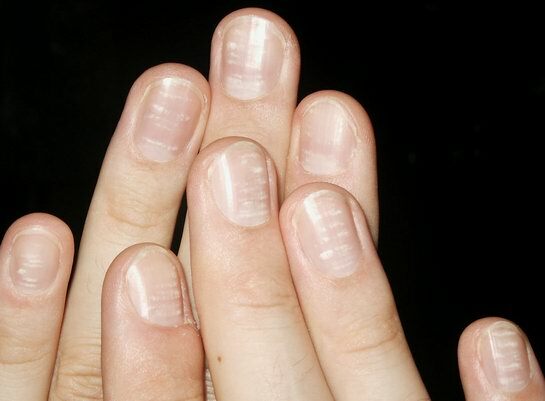 If you have calcium deficiency then nails will be very weak and it will start rupture from the middle. Delay Puberty in adolescent girls: In the case of women delayed puberty and menstrual disturbances is the sign of calcium deficiency. Many teenage girls can get pain before menstrual. Hair Loss and Failure: Hair loss and failure occurs due to shortage of calcium. Hardness and dryness is very common in hair. Fatigue: When you have bone and muscle pain all the time then you get fatigue. Less sleep, scared and mental tension are the symptoms of less calcium. It directly increases the stress level and fatigue. You will see tired and lethargic all the time.